For some reason, it seems raptors and similar birds seem to be drawn to wind generators it would seem. The numbers that are killed by these machines seem to be out of proportion. We have all seen the video of the circling raptor that eventually gets taken down by a blade, but why was it circling closer and closer? Is the ultra low frequencies a “lure” to them? There has to be some reason outside of a death wish. Every year in Spain alone — according to research by the conservation group SEO/Birdlife — between 6 and 18 million birds and bats are killed by wind farms. They kill roughly twice as many bats as birds. The rat plagues are caused by the wind choppers killing of the hawks and kites, that’s so obvious cause and effect!! STOP ALL BIRD CHOPPERS NOW!! Why aren’t the animal rights activists and greenies out there protesting? Because THEY are part of the problem !!! Sucked in to the AGW scam, and nothing else that used to matter, matters any more. Why aren’t they out there protesting? Far too cold for that today, Robber, they’re all inside trying to keep warm. From your Bureau of Muntedology itself: 1.2˚C BELOW freezing at Salmon Gums, WA this morning; 1.5˚C BELOW freezing in Tasmania, snowing with a minus 18˚C wind chill howling across Mt Mawson and kunyani; then by tomorrow, the snow blizzard arrives in the South Island with sub-zero temps (down to minus 12˚C wind chill) gale force winds and 30-50 cm snow forecast for the next few days. As usual, our MetService ignores their own prognostication of cold and snow by screaming “28˚C scorcher for NZ Wednesday”. Surely they’re aware of what orographic winds are capable of doing? Anything over 20C is a heatwave in NZ isnt it? Cold dont exist, snow has been eliminated..
NZ doesn’t get heatwaves … it’s never hot enough for long enough. Because their income replies on keeping the renewable industry going. So sick of the green double standards when it comes to act on actual environmentalism, what the article fails to show is the actual carnage these expensive asshat engineered turdbines really do. Save the eagles international. http://savetheeaglesinternational.org/ The evidence is there the courage to face it is not. 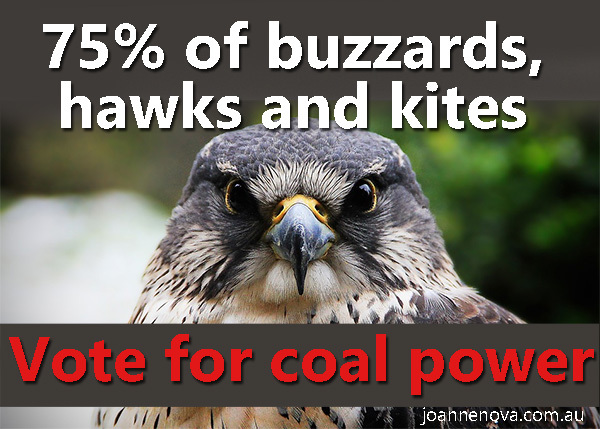 The usual green rebuttal is cars, cats ect kill more birds than turbines if so the idea that they kill is admitted and an increased mortality factor is justifiably introduced, I’d be interested to see how many birds coal power stations kill? Call them out on the double standards. They are like delinquent teenagers, that need a bit of tough love to sort them out and get their heads straight. Unless we verbally get in their faces and expose the lies, nothing will change and we will continually, by default, excuse their outright lies…. The rebuttal to their cat excuse is to inform them that you have already moved to a personal cat free future in order to protect the environment and refuse to take them seriously unless they provide proof they are doing the same. Hi Yonnie, me old china! Or all those birds incinerated in one of those gas flares. I see the logic here. What you do is bad, so, so what if what I do is bad? Is that about it? So you are offsetting my bad with your bad. Cool. Makes all the sense in the world. Do you really realize how stupid your argument really is? Which slaughter hawks, buzzards and kites. Let me be the first (today) to say congrats for that one, Ruairi! The idea that in a modern world of reliable and sustainable nuclear power and HELE coal fired power plants we should instead use thousands of wind turbines to power a modern society smacks of utter stupidity of the extreme kind. Then there is the cost difference. It’s time Morrison came out and prosecuted the case more strongly for coal and nuclear and against all forms of renewables. Not one cent more should be spent on renewables and a whole lot more spent on at least coal to help our nation sustain a viable and economic future, just as so many other nations are already doing. The LNP has one last chance to avoid our nation being smashed by the left if ALP+Greens win. He better get cracking soon and stop playing hide and seek. Actually, you use thousands of wind turbines to make attempting to run a modern society more problematic and expensive. You can’t run a modern society with renewable energy. You can only destroy one. PeterS, the point is you can’t run a modern society on windmills, so the solution is – get rid of the modern society. Simple. Loin cloths and clubs should be good enough. The top raptors are wiped out by windfarms, and the same idiots don’t see the connection to increases in vermin rodent population. Can someone educate the alarmists that their actions have consequences. No…they are just like spoilt children. They have a mental age of about 5, complete with tantrums and always being told they are “special”, when in fact , like children, they need constant correction to keep things real. Like Fran Kelly this morning spending more time moaning and interviewing RSPCA about the horse that had to be put down than the winner and the benefits of the Melbourne Cup! Will Aunty flog this as Vic Racings ‘Khashoggi’?? And just to back Aunty up the celebrities think it’s a great idea! Perhaps the raptors aren’t getting any sleep? The World Health Organisation this month recognised that living near a wind farm producing excessive noise is a health risk and it released new guidelines for noise levels, insisting that exposure to wind turbines shouldn’t exceed 45 decibels during daytime. The problem is that what needs to be measured is NOT strictly within the hearing range. The very low frequencies involved resonate the bodies cavities, like the skull, eye sockets, the diaphragm, the spinal cord, etc. And it is this (IMO) which causes the problems. Unfortunately when sound, or acoustic noise is measured often an ‘A weighted filter is used. Look at the low frequency end of this filter and you’ll cut out the low frequencies. Look HERE for ‘A’, ‘C’, and ‘Z’ filters. Note no acoustic measurement filter is designed to measure very low frequencies in the 0.5 (or below) to 20 Hz region. That’s it, the carefully hidden Scandal of VLF pulsing. “Noise” has been used as a smokescreen despite the fact that Infrasound has been known of for Twenty Years. This cover-up needs exposing and those responsible made to pay compensation out of their own pockets, not from the public purse. Dr. Mariana Alves-Pereira,an expert on harm from LFN and infrasound radiation from turbines, has stated that knowing what she knows, she would not live within 20 km from wind turbines. Why have rural residents had their homes surrounded by turbines? Why are these turbines still running? Those who are responsible for these dangerous siting decisions need to receive ‘letters of liability’. Who will be held liable for the death of raptors from these turbines? Ah, the ecosystem. Remember getting rid of cattle from the high country because they damaged the environment. Brumbies on the other hand are “part of the heritage of the high country, so they are sacred. Screams about feral deer numbers damaging the environment kill, kill, remove. Feral brumbies in the Bahmah forest are starving due to drought. Save save at any cost. The hypocricy is writ large. And the weeds continue to prosper and add to the fuel for wild fires in future. Native grasslands no longer managed as they were for thousands of years before white colonisation in 1788, and afterwards by cattlemen who took advantage of the higher country grasslands. I really like this guy for his educational astronomy and physics videos… here is his last one on the earths atmosphere… I hope he doesn’t lose his job!!! O/T – Anyone know which is the best unbiased US election web site to monitor voting please? If the USA swings politically to the Left, Australia will follow suit. Anyone conservative ( especially Christians ) will be marked for eventual “re-education”…. Chiefio is hosting a comments page. Usually has good reports cited. Info: He currently lives in California. His name is E. M. Smith. Has worked in Florida. Computer guy. Lots of interests. Whats your gut feel for how it will go? I got the impression that the fact that Hellary still hasnt been put in prison, plus the out of control treatment of Judge Kavvanagh plus the obviously illegal planned land invasion of the USA is going to backfire badly on the Left. I think the election is only half the story. The Left are clearly deranged and evil anarchists, I suspect what happens after the election when they lose will be as important as the election itself…..
Its interesting to see the mask come off the Democrats to see their true Communist identity revealed. This is the sort of study that needs replicated in other places and over a few years. The results seem quite damning and thus warrant the price of more research. Many previous reports appear anecdotal — it is not that they are not true, it is they just haven’t been properly done. Or the money could be used to knock all the many (300,000 ?) of them down and we could get on with building reliable power sources. I’d vote for that! WHO says they are injurious to health. The Dirtiest Secret of Them All. wind turbines are noisey, high maintenance, uneconomic, money gulping BirdChoppers. As Michael points out at #9, they are also causing massive environmental damage. In short, they are doing everything in Contradiction to their stated Raison d’Etre. This is all in public view to some extent but the Ugliest Dirtiest Secret has only just been made Public by the WHO, and this only because some very brave researcher in Europe exposed it in a “scientific paper”. VLF pulsing, aka Infrasound has been a known, serious health issue for at least 20 years. Just imagine the damage done to a human body when the automatic control of the heart_lung is overridden by the VLF Pulsing from a Wind Turbine. Just imagine, all of your pressure sensitive body surfaces, skin, aural system and internal lung surface being pressured up and released at roughly the same frequency as your heart beat. This pulsing is fed back to the automatic control system in the brain and causes confusion, with resultant Nausea and Heart Damage. This has been known for Twenty 20 years. Who caused this important knowledge to be Hidden?? Make No Mistake, the Renewables Industry appears to be a product of altruism. How many Human Lives have been Devastated by Infrasound? Yep, serious money which would not be available without the RET. Let’s kill the RET. WHAT I find ever so slightly concerning is the way Warms like to accuse Realists of using the same tactics as the tobacco industry to cover up the risk to the planet, while at the same time effectively using the same tactics as the tobacco industry to cover up health risk to the population. Deep Sixed but not deep enough and I hope it is fully exposed. Windturbine pulsing is a Danger to Human health. Just imagine being seriously seasick for months on end until your bodily structure finally fails. Mechanism > Government Regulation to save Planet. Victims > Rural Dwellers in the way. Morality in Government > Flushed down the plughole in the corner. Aided and Abetted by > Mainstream media. Meanwhile our minister for getting electricity prices down Angus Taylor reports in today’s Australian that more renewables are coming. “The growing market power of energy companies combined with the unprecedented investment in intermittent solar and wind generation without storage threatens the affordability, reliability and security of our ­National Electricity Market”. But what is he proposing? Even more redundant investments. “We are working towards a shortlist of electricity generation investment projects by early next year that deliver when customers need it (likely to include coal, gas and hydro), balancing the unprecedented investments in solar and wind. These new projects will drive increased competition and supply to enhance affordability and reliability”. Stop the policies that are driving those investments in unreliables! Give every generator the obligation to provide power 24×7 on demand at a fixed price each month, not bid to supply the next 5 or 30 minutes. One glimmer of hope: “We are committed to obligations for retailers to ensure ­reliability of supply by mid-next year. Requiring investment years ahead to meet expected demand, even when the sun isn’t shining and wind isn’t blowing, is standard in most developed countries”. I am extremely disappointed with the confused verbalism that covers the reality about electricity supply reliability, cross subsidies and Cost. Shouldn’t that read ‘deliberately‘ confused verbalism? Yes, but isn’t that the whole point of it, to mislead and obscure the truth. Used to be called Verbal Diahorreah or similar. Now it’s just normal PC speechifying. Yes, which is what I was saying. Pratchett described people like this as similar to cuttlefish, disappearing in a cloud of ink in distressing situations. These days the ink is replaced by sound bites, but the principle stands. It seems to me that I have been seeing quite a lot of Raptors in the Bacchus Marsh area this year. There is a new wind farm about 15 km away. Hopefully it will not kill too many of them. I had a very close encounter with a wedge tailed eagle last Sunday. The eagle and I had different ideas about the best way to climb in a thermal. This time my way seemed to be about equal to his and we can close to collision 3 times as our courses converged. The eagle showed his superior manoeuvrability by flipping out of the way at the last moment. It’s no surprise. This effect has been known for quite a while now but has been ignored by politicians, rent seekers, activists and UN. Those windmills are the most ugly engineering edifices to blot the landscape. As well as bird manglers, scenery destroyers. “Nine species of vulture can be found living in India, but most are now in danger of extinction after a rapid and major population collapse in recent decades. As recently as the 1980s there were up to 80 million white-rumped vultures (Gyps bengalensis) in India; but today the population numbers only several thousand.